This compilation introduces a new direction for Now-Again Records and its owner, Stones Throw Records GM, A&R and producer Egon. With the same detailed, no-stone-unturned approach he used for Deep Funk (The Funky 16 Corners, Cold Heat), he tackles beat-heavy global psychedelia with Forge Your Own Chains. ''Those of us birthed into record collecting by the Hip Hop midwife revered Jimi Hendrix as well as James Brown. We searched for albums by Mulatu Astatke and Power of Zeus with the same fervor,'' Egon writes in his introduction to the comp. 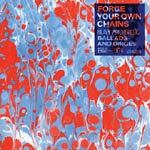 Forge Your Own Chains showcases music from all corners of the world: Colombia, Nigeria, Sweden, South Korea, Thailand and Iran. The focus - in keeping with Now-Again's tradition - is on melody, driving rhythms and accessibility. Not one song is included on this compilation because it is from a ''rare'' album. Certainly, many of these songs do spring from albums that exchange hands for many thousands of dollars and many of these songs have never seen reissue. But these songs are all beautiful in their own right and work to form a coherent album. Psychedelic records, long the mainstay of older, grizzled collectors and seemingly quaint, are, in the hands of Egon and those of his generation, giving up new ghosts. And, with comps like Forge Your Own Chains, inspiring new investigations into our not so distant (and still very much alive) musical past.